The time has come for my series on Georgian Era servants to exit the manor house doors and stroll about the pristinely manicured garden pathways to meet the men (and upon rare occasions the women) who performed their service outside. Six previous posts were necessary to detail the army of staff and servants working inside the house. Be sure to look back on the blog if you missed those essays and the accompanying posts on related topics. I do not need as many installments to cover the folks who labored outdoors, but this does not mean their jobs were less important. As will be revealed, the stable staff, gamekeepers, and groundsmen were equally vital to the upkeep and functioning of a great house, and for the prestige of the family dwelling within. **NOTE: I apologize for this post publishing on Tuesday rather than Monday. I am currently visiting my elderly father in Mississippi and keeping very busy. Time got away from me! I shall try to get back on track. Be sure to check back during this week for follow-up posts on this topic. Tomorrow’s blog post will discuss the history and evolution of landscape design in England. Yet even without that additional and fascinating knowledge, anyone who has watched a BBC production has seen how vast the lands surrounding a country estate. These immense gardens were often designed by hired landscape architects who completed the job then moved on to the next wealthy client. Thereafter it was up to the groundsmen to keep those sculptured grounds perfect, and the task required a host of skilled workers. All of the groundsmen from the boss on down were far more than simple gardeners. There wasn’t a single chore from cutting the grass to erecting an elaborate structure to clearing the paths of debris that they weren’t responsible for and prodigiously skilled at. Above all, be assured that these men (and women) perfected their art with passion and loving care. Furthermore, they weren’t only in charge of the ornamental pleasure gardens but also the extensive herb and kitchen gardens, and the fruit-bearing trees required to feed the family and guests. Maintaining such elaborate and enormous gardens was an ongoing task that easily required up to 100 groundskeepers for a Pemberley-sized estate. Dozens more might be needed if garden construction was underway. Typically there was one Master Gardener who oversaw everything and consulted with the Master of the estate and/or the Estate Steward. 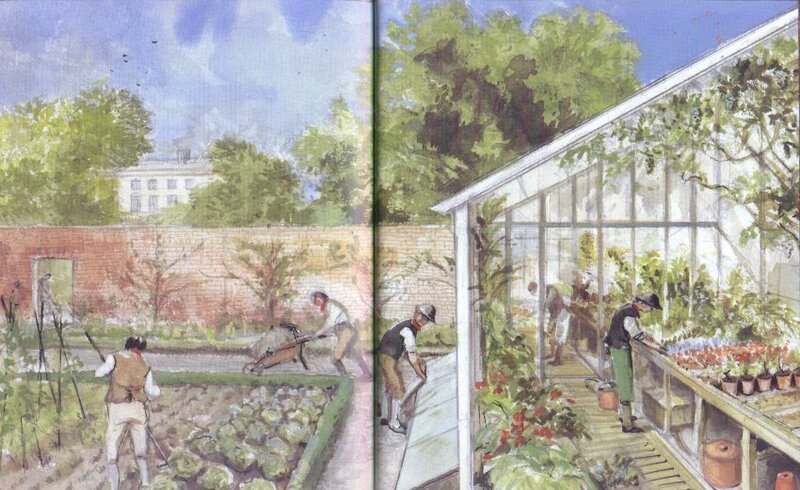 Assistants would be assigned to manage specific areas, such as the orangery, kitchen gardens, ornamental gardens, orchards, and so on, each with a crew of apprentices and laborers under their command. Those groundskeepers in the top tiers of the hierarchy began as simple gardeners, training over several decades to increase their knowledge. They would have a thorough understanding of the indigenous and exotic plants, pruning, pest control, soil types, seasonal care, weed abatement, as well as complete training in the mechanical functions of the fountains and hothouses. The truth is, I have searched a number of times for specific information on who took care of the upkeep and repairs to the house itself. Logic dictates there had to be a passel of workers who did nothing but fix broken tiles, clean the brick walls, repair cracked window panes, patch leaky roofs, repaint the trim, empty the gutters, sweep the terrace, remove mold and moss from the statues, and so on. Yet, I’ve found nothing to indicate a special branch of servants with a unique title, so have concluded Georgian handymen fell under the broad “groundskeeper” umbrella. “A conservative estimate of the annual cost of maintaining a historic house is 2 per cent of its value,” says George Burnard, of Strutt & Parker’s country house department. So Mr Blair would spend about £600,000 on Winslow Hall each year. This American has no idea what the US dollar value of £600,000 is, but any currency with that many zeros is bound to be a huge number. And granted we are talking 2007 versus the 1810s. Still, any way you slice it, we are talking a hefty sum. Additionally, in an era before power tools and a nearby home improvement superstore, the amount of work is mind-boggling. No electricity, no water pumped via long hoses, and no gas-powered riding mowers. 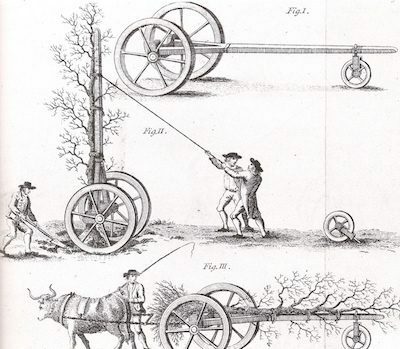 Yes, gardening was rough physical labor in these bygone days. However, what they did have was a wealth of tools for every need. 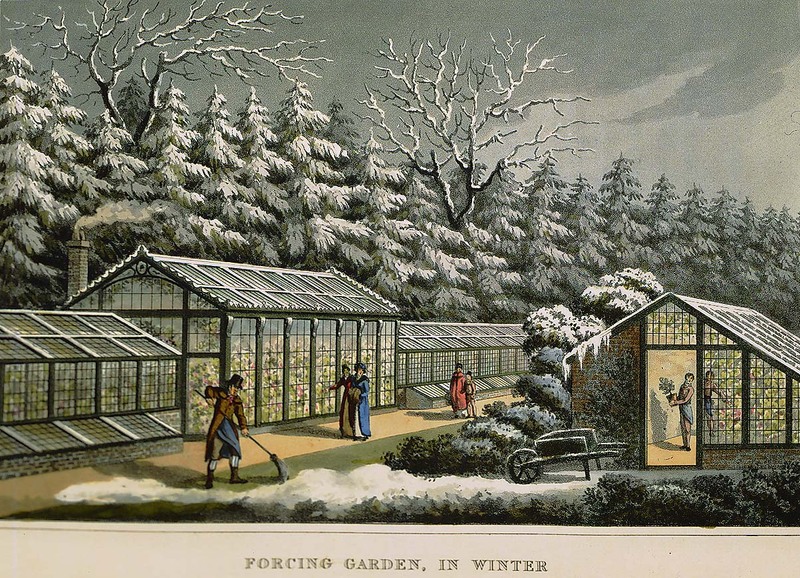 According to famed gardener John Evelyn (1620–1706) who wrote Elysium Britannicum, or The Royal Gardens in Three Books, one list of “absolutely necessary” gardening tools included: iron-clad spades, rakes, hoes, pickaxe and shovel, sieves and screens, dibbers, transplanter, a planting lattice, ladder, trowels, turf lifter, turf edger, scyther, slasher, stone roller, leveller, tamper, funnel, shears, and long pruners. And that was just his first list! Perhaps the toughest task was keeping the extensive lawns cut. Grazing sheep and cattle represented the first lines of defense. In part, the roaming animals were a visual feature, the appearance of roaming wildlife fitting in with the natural aesthetic desired during this period of time. Primarily, they were useful in managing plant and grass growth, although grazing animals rarely nibble in perfectly neat rows. Furthermore, there was the downside of turf gouged by sharp hooves and animal droppings, which, while natural, might mar the pristine visual This is another reason why the meticulous planning of the landscape was essential. Animal herds do the trick in keeping the grass under control, as long as they stay in distant meadows. So what about cutting the lawns designated for strolling or gaming fields? 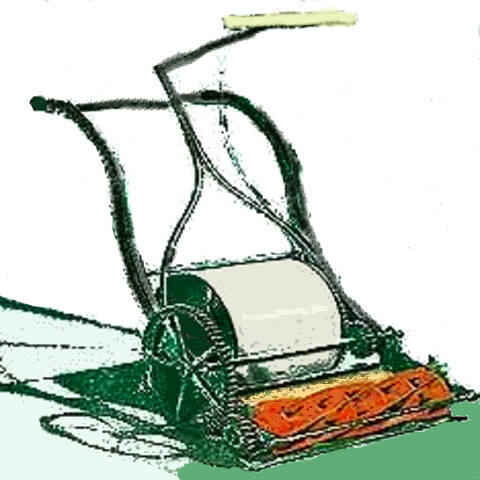 As the drawing below left reveals, the most common technique was coordinated teams of laborers wielded scythes to clip the grass, using a smooth, well-rehearsed motion to cover large areas of ground. This would be done at least weekly during the spring to autumn months. Drawing of a family using scythe and shears. Share your thoughts and questions with me NOW!